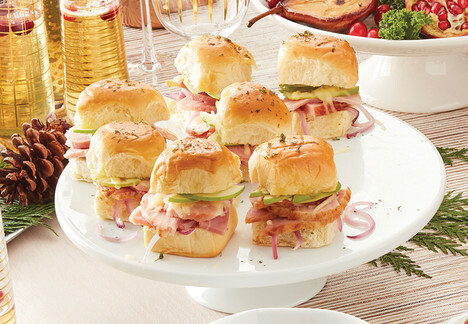 A cheesy baked ham sandwich that provides an easy way to feed a group. Line a 9x13-inch baking pan with aluminum foil and coat with cooking spray. In a small bowl, combine cranberry white cheddar and havarti cheese. Reserve. Remove the entire package of rolls and keeping rolls connected, slice in half like a hamburger bun. Place bottom half of rolls in baking pan. Spread with mustard. Top with red onion, ham, apple, cheese mixture and bun tops. In a small bowl combine butter, garlic powder, salt and parsley flakes. Pour over sandwiches. Remove from pan and cut into sandwiches; serve immediately.